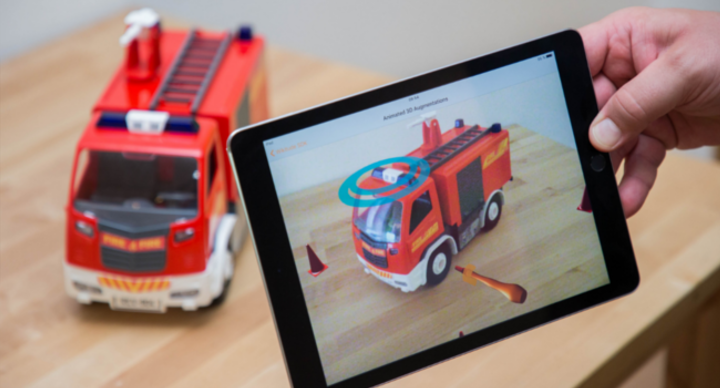 See beyond reality with Wikitude’s powerful SLAM solution for Augmented Reality apps! SLAM (Simultaneous Localization and Mapping) is a technology which understands the physical world through feature points. This makes it possible for AR applications to Recognize 3D Objects & Scenes, as well as to Instantly Track the world, and to overlay digital interactive augmentations. Instant tracking allows you to place digital content indoors and outdoors without the need for a target. Unlike Image and Object Recognition, which rely on pre-mapped targets to trigger the display of digitally augmented elements, Instant Tracking is markerless. So, instead of requiring a target, it tracks features of the physical environment itself to overlay AR content. Wikitude provides it’s own SLAM based instant tracking and, when the devices support it, it makes it possible to use ARCore’s or ARKit’s instant tracking. Object recognition enables real time and 360 degrees augmented reality experiences around real world objects, that were pre-defined by you. With SDK 8, Wikitude extended this SLAM based feature to support recognition and tracking of larger objects, rooms, and scenes. The practical applications are numerous, so whether you are building your next interactive marketing campaign, enhancing in-store experiences or remotely assisting workers on a factory floor, object recognition will close the gap between the physical and digital worlds.